Ordered from Amazon, but not delivered via drones. My stack of waiting-to-be-read business books. 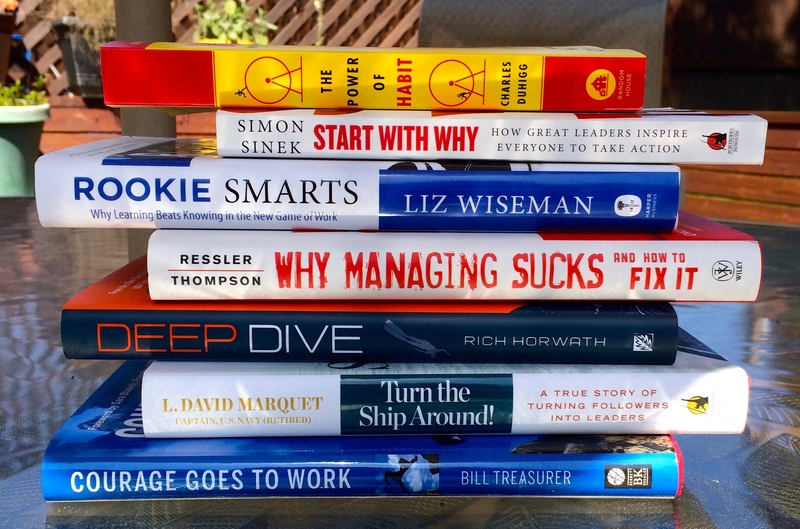 I was going to start in on Rookie Smarts, but when I finally gathered all the new books in one place, the one that spoke to me was Turn the Ship Around! My friend Kathy recommended that book for me (along with Deep Dive). I was intrigued by the title, and thought it aligned nicely with what I had been trying to do with the chapter team I had been leading (still leading, until my term ends on May 21). You know, getting them to turn things around and do different things/try different things than what the chapter has done in the past. So I started in on it, and whoa . . . I can read through books fast, but with this one I’ll have to take it a bit slower because it’s all about this Navy guy leading his team, and the location happens to be a submarine. That’s a new locale for me—the Navy, and leadership on a submarine. But so far, it’s a good read. Will be interesting to see which of his concepts I can apply in my work/leadership life. This entry was posted in Books, Leadership and tagged business books, L. David Marquet, Turn The Ship Around!. Bookmark the permalink. I like having a stack of books to read like that as well. Can’t say I get through mine very fast though. I usually have two books going. One for the bus ride to/from work, and the other laying around in the house. I’m desperately in need of another bookcase! Thanks for stopping by and taking the time to comment! Good for you. Many thanks for stopping by my blog. Hey thanks, and for stopping by mine as well! Can’t wait to hear what you think and what lessons you have learned so I can pick your brain…and oh, if you just can’t wait for those books to arrive, maybe there’s an e-book?